Dr Marius Kwint is Reader in Visual Culture in the School of Art and Design at the University of Portsmouth, UK. 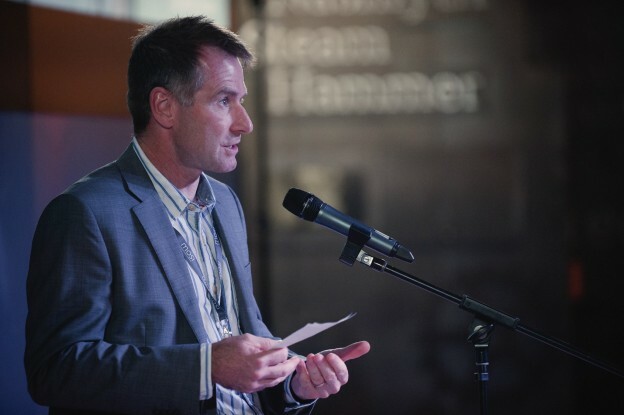 In 2012 and 2013, he was lead curator of the highly popular exhibition, Brains: the Mind as Matter, on the visual and material culture of neuroscience at Wellcome Collection, London, and at MSI Manchester. His most recent major project was co-curating, with Sundaram Tagore, the Venice Biennale official collateral event Frontiers Reimagined: Art That Connects Us, featuring 44 artists from around the world on the subject of cultural crossing-points. Marius Kwint: It’s fairly eclectic. I was born in Sacramento, California, but mainly grew up in East Anglia, in the English flatlands that had been peppered with Allied airbases during World War II and where a few USAF bases remained during the Cold War. My father, a naturalized Dutch-American, was a teacher on one of those and my Scottish mother taught in local primary schools and was an accomplished amateur mezzo-soprano. In retrospect, it felt poised on an aviation bridge between east and west, as during the holidays we would visit family and friends in California, The Netherlands and Scotland; and at school in an otherwise sleepy town, we were very aware of the F-4 Phantom jets roaring on exercise in the big Suffolk sky above us. Fear of nuclear Armageddon was a constant and probably affected many children more than adults, who all seemed very blasé about it. But it was, in retrospect, stimulatingly between worlds: freewheeling American modernity on the one hand, the deep visual culture of the Netherlands on the other, and an old-fashioned provincial English schooling in the middle. That’s all quite autobiographical and more than just ‘something’, but may suggest general influences with regard to being between things. Although I had tended to succeed in English and art, I went to study geography at the University of Aberdeen in Scotland. Fortunately, the Scottish undergraduate curriculum allows some shopping around in the early stages and I ended up taking my honours in a new and unique degree programme in Cultural History. The twin concepts of culture and history seemed to hold out the challenge of forging a unifying and seamless vision from infinite diversity, and I loved it. With input from many staff and only a few students, we had some extraordinarily privileged tuition ratios and the staff, from various disciplines, clearly enjoyed teaching from their research topics, so there was an exciting spirit of innovation and joint exploration. From there I went onto a doctorate in the history of the circus—which seemed an untrodden, vibrant and anthropologically intriguing path–at Magdalen College, University of Oxford. That’s another story. Subsequent jobs included a two-year research fellowship at the joint postgraduate programme in History of Design at the Victoria and Albert Museum and Royal College of Art. There I investigated the history of the souvenir and organized a conference on objects and memory, entitled Material Memories, and edited the book of proceedings in 1999. I went onto lecture in History of Art at the University of Oxford, where, among other things, I ran the doctoral programme and devised and taught a popular master’s option in the History of Collecting. Then, in 2008, I took up a new post in Visual Culture at the University of Portsmouth, as part of a team teaching the mainly written strand of undergraduate degrees in Photography, Illustration, Fashion and Textiles and Graphic Design. Working with studio-based students can be refreshing and calls for versatility, because our curriculum is less bounded by periods, places or premises than is mostly the case in the mainstream humanities and social sciences, and we advise them on an immense range of dissertation topics. Their achievements are impressive and many go on to win national and international awards. RB: Your work explores the intersection of art, science and visual culture. What inspired this exploration? MK: It was more a case of predispositions and cumulative influences than momentary inspiration. I’ve long tended to resist the categorization of people as being either artistic or scientific. As a child, I liked drawing and designing aircraft and other exotic forms of transport, so the appeal of technology was already in my visual imagination. Graphic design, which I later enjoyed, can also involve a certain amount of precision. And I initially wanted to do geography at university in part because it combined the human and earth sciences. Once I had plumped for the explicitly interdisciplinary Cultural History course at Aberdeen, we were taught by historians of science Nick Fisher (whose wife Beth is a distinguished artist) and Andrew Wear, among others. During that time I listened to a talk by Martin Kemp, who had come up from St Andrews, where he was professor. We were all quite struck by his knowledgeable exploration of optical and geometrical ideas in Renaissance painting. Later, he got the chair in History of Art at Oxford and recruited me to his department. He was influential and helped to open some doors to the field with his contacts and suggestions. Also, at Oxford, the college system means that you don’t just associate with people in your department or discipline, so it makes sense to be able to converse at length with peers about their research in different subjects, especially at mealtimes. That commensality is much of the value of collegiate universities. My partner Jemma was a neuroscientist, which was a more routinely gregarious undertaking than writing a thesis in history, so I became a sort of honorary member of the Department of Physiology, where she worked alongside people such as the distinguished neuroscience communicator Colin Blakemore, and which had a modest café for lunch and a good social life. The research discussions there – for example on neural networks and computer models for cognition, and on the senses and perception – were exciting, contemporary and seemed relevant to me as a cultural and art historian. After our doctorates, it was Jemma who was first off the mark in the art-science domain. 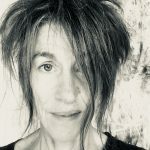 She worked as an audiological research scientist and, with her then artist sister Henrietta, obtained a grant to mount an interactive artwork based on her research. This was on the phenomenon of otoacoustic emissions, in which the ear produces a sound in the act of hearing that can be traced using sensitive equipment. 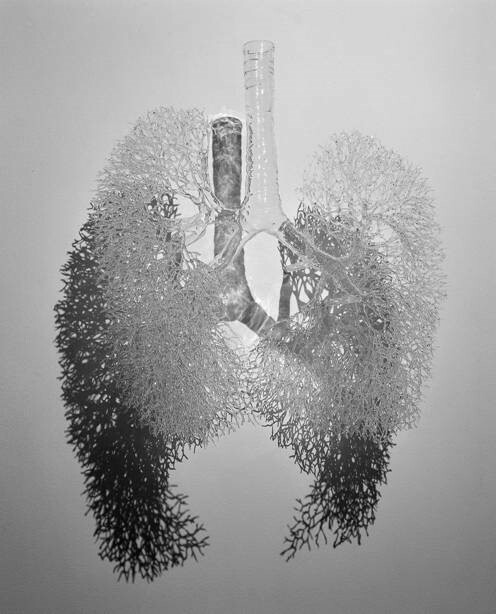 Called Soundings, the project was exhibited at the hospital where she was based in Southampton and at the Creating Sparks Festival at the Royal College of Art in London in 2000. 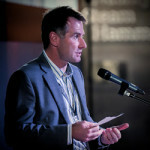 It included commissioned works from other artists, among them the distinguished poet Simon Armitage. Being interactive and exhibited in a hospital meant that Soundings engaged social groups that most official art spaces would not normally attract. The ‘visual culture’ element of the formula is a way to broaden the purview and incorporate the more socially diffuse habits of viewing and other genres and media beyond the rarefied category of fine art. It also loosens the restrictions of chronology and geography. Many of the things I’ve exhibited and written about, such as diagrams, designed objects or scientific specimens, are ‘applied’ or ‘working’ artefacts that are not traditionally among the fine arts but have aesthetic and functional characteristics that clearly make them part of a material and visual culture, or shared practices and assumptions. Of course, separating out the ‘visual’ from the other interacting senses that inform our cultural experience is problematic and potentially limiting. But it’s a widespread working definition for the time being, especially as far as art school curricula go. RB: Much of your recent research work has been based on exhibitions. What is it about ‘exhibition focussed’ work that appeals you? MK: I like the collaborative, multifarious and public nature of putting on a show. One learns a lot from the variety of skills and activities required, ranging from talking with artists and scientists, to writing wall texts and press releases, and liaising with the staff, media, VIPs and the public. Discussing research ideas with artists and commissioning and developing new works with them is especially enjoyable. Artists and performers usually make considerable personal sacrifices to cultivate and share their talents and deserve every bit of support. Exhibitions are also live events, so there’s a certain performative, ephemeral magic about them. A well attended preview night is a buzz. With other media such as printed publications or broadcasts, the relationship with the audience is remote, whereas with an exhibition, people come in person, from far and wide and usually of their own free will, and can share it with you. I enjoy guiding friends, colleagues and strangers around the show or merely observing their responses. In my university vacations I worked in adventure sport tourism for many years and I suppose this continues that theme of recreation and hospitality, though my exhibitions aren’t simply fun, by any means. In the UK, there’s now funding pressure on academics to show the ‘impact’ of their research beyond the ivory tower, and exhibitions are one obvious way of doing this. Museums and galleries are, after all, long-established vehicles for art-historical scholarship. In the 2014 UK Research Excellence Framework (REF), 18% of the submissions tendered for assessment by art and design departments were exhibitions. They’re more than just public engagement exercises downstream of research published properly in journals and monographs, and can be based on fresh ideas and extensive primary research developed over several years, producing substantial and lasting records such as catalogues, videos and new artistic commissions. Like many forms of art, design and performance practice, they deserve growing and widespread recognition as research endeavours in their own right. 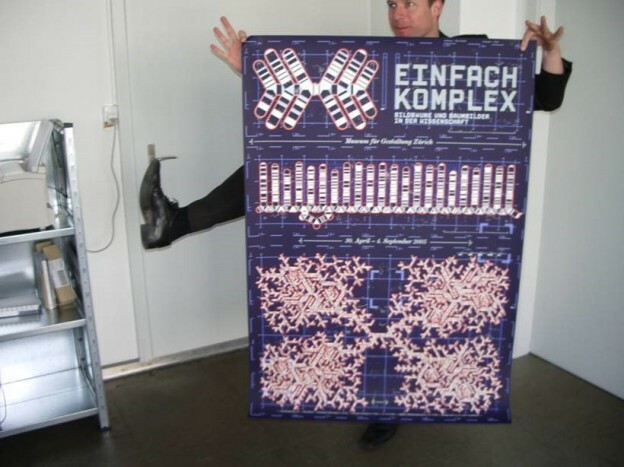 Museum Director Christian Brändle with in-house designer Martin Woodtli’s newly delivered poster, Einfach Komplex exhibition, Museum of Design (Museum für Gestaltung), Zurich, 2005. Photo: Marius Kwint. RB: In 2005, you devised and co-curated a major exhibition, Simply Complex (‘Einfach Komplex’), which was an exploration of the dendritic form. Can you say something about this exhibition? MK: Now that really was a momentary inspiration. I remember daydreaming out of the window of our departmental offices in Oxford during a meeting, admiring a large horse chestnut tree rising from the neighbouring apartments and office blocks. It was around December 2003, and sight of the leafless branches against an overcast sky made a stark impression upon me. Suddenly, I connected it with all the many dendritic, or branching shapes in things other than plants that I had seen over the course of my education, such as images of river deltas, road networks, snowflakes, organizational charts, or the vascular and nervous systems in the body. The anatomical drawings of Leonardo da Vinci, in which Martin Kemp was a leading authority, came freshly to mind. I thought of collecting diverse examples of arborescent forms and editing them as a popular science coffee-table style book entitled Winter Tree, inviting scientists to write a few paragraphs from their expertise on a selected image each. After drafting a short proposal that evening, I mentioned it to Martin, who paused thoughtfully for a moment, said ‘There’s a lot of mileage in that’, and offered suggestions for artworks and phenomena to include. I also talked about it to a Swiss doctoral student under my supervision, Barbara Bader, who’s now a professor in Stuttgart. She had heard that the Museum of Design (Museum für Gestaltung) in Zurich was on the lookout for exhibition proposals and so approached them; their new curator Andres Janser then invited us over to pitch the idea and took both of us on. The timetable was tight, since by then there was about a year before the five-month slot opened on 30th April 2005 (my 40th birthday), but with Andres’ effective and intellectually rigorous leadership, and generous support from the Swiss Science et Cité foundation, we put together a large (1000m2) exhibition featuring dendritic phenomena from the latest computer animations of neurons to early photographs of snowflakes, and from Lichtenberg figures capturing electrical discharges to art installations made from growing urea crystals. 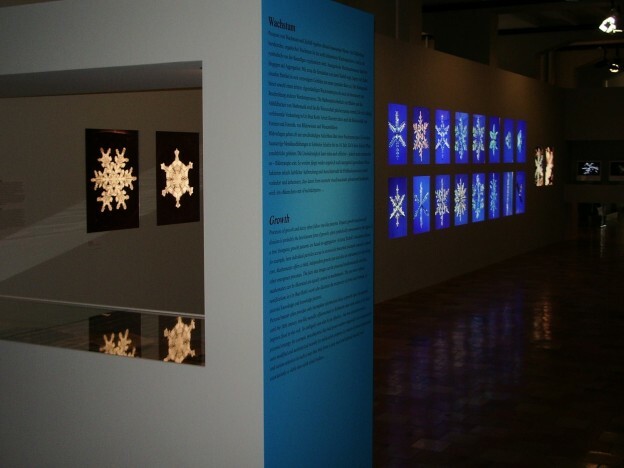 Introduction to the ‘Growth’ section of the Einfach Komplex exhibition, Museum of Design (Museum für Gestaltung), Zurich, 2005, showing dendritic ice crystal (snowflake) photography old and new. Photo: Marius Kwint. We divided it into three sections: Growth, Order and Exchange, based on the salient functions of the dendritic form. ‘Winter Tree’ was thought not to have the right deciduous connotations in German, so it was entitled Einfach Komplex: Bildbäume und Baumbilder in der Wissenschaft, or roughly ‘Simply Complex: Picture-trees and Tree-pictures in the Sciences’. That doesn’t translate straightforwardly either, but was intended to suggest the circularity of visual culture: that images tends to beget images, even when they have an empirical purpose. Andres stressed that it wasn’t the job of a design museum merely to celebrate or explain the occurrence of dendritic phenomena from a scientific point of view, but critically to evidence the aesthetic strategies and design decisions at play in scientific figurations. That was my first in-depth involvement in a major exhibition and a vital apprenticeship. It’s very gratifying to see your idea take such extensive physical shape: not only in the exhibition itself, but big posters in prime spots all over the city, the catalogue in bookshops, advertisements and reviews in the media, and so on. Visitor numbers were good; the museum was pleased, and it was shortlisted for the Swiss Prix Expo. 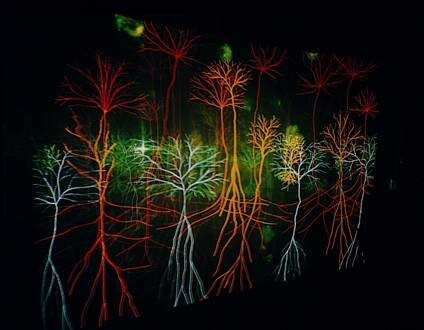 Two of the key artists featured in the exhibition, Annie Cattrell and Andrew Carnie, became firm friends and collaborators, as did the contributing neuroscientist Richard Wingate, whose in vivo films neurons advancing across the brain of a chick had inspired Andrew’s pivotal Magic Forest installation. Annie Cattrell, Capacity, hand-blown laboratory glass, 2000, as exhibited in the Einfach Komplex exhibition, Museum of Design (Museum für Gestaltung), Zurich, 2005. Photo: Peter Cattrell. Andrew Carnie, Magic Forest, 25-minute 35 mm slide-show installation (2002), as exhibited in the Einfach Komplex exhibition, Museum of Design (Museum für Gestaltung), Zurich, 2005. Photo courtesy of the artist and GV Art, London. RB: Why is the dendritic form such an instructive one in the sciences? MK: Trees exemplify the relationship between structure and function, and so are object lessons in natural design. It’s easy to see how their shape supports photosynthesis and respiration by the leaves and the absorption of water and nutrients by the roots. Their growth can also be easily intuited from the fact that one branch splits into two, and so on, so they serve to instantiate the passage of time. Their shape and features also give clues about the kind of environments they inhabit, especially with regards to soil and climate. So trees have an indexical quality, and most naturally occurring, non-botanical arborescent forms will likewise reveal differentiating aspects of themselves. I’m no mathematician, but learned in geography that river systems can be fairly simply described numerically in terms of bifurcation ratios, based on the hierarchical ordering of branches, or Strahler numbers. High complexity (lots of branches) produces a high bifurcation ratio, which in the case of drainage usually means that the ground has low porosity and a higher chance of flooding. More versatile indices of such non-linear forms are available in fractal geometry. Related techniques enable the identities of individual dendrites to be digitized and, for example, for airport retinal scans to take a biometric ‘fingerprint’ of the capillaries at the back of the eye. Dendritic figures are sought, identified and assessed in many other areas of science, such as in materials science with solidification dendrites to test for impurities in alloys, and pre-eminently in neuroscience in the case of brain cells or neurons. Dendritic forms also have long histories in human artifice: in the visualization of lineage and organizational structure more generally, most notably in genealogy, or for distribution and communication through networks (either by deliberate design as in ventilation ducts or evolved through social action as in the case of many road systems). The exhibition had a large eighteenth-century painted family tree of some notable Zurich gentry and several other examples of dendritic graphic rhetoric being used to make more dubious claims of origin and descent, not least in the field of art and design history, where there have been many attempts to map apparent historical influences and progression. Much of this imagery is more or less freighted with the ancient symbolism of the natural tree, which we explored by means of such exhibits as an ancient Syrian cylinder seal, showing a tree representing the cosmos. Shortly after the exhibition, I was contacted by the eminent engineering professor Adrian Bejan from Duke University in North Carolina, who had been recommended it by one of my Oxford colleagues. He was enthusiastic to learn about the show and we’ve since exchanged visiting talks. Adrian is well known for his ‘constructal theory’, which offers a general account of the relationship between size, shape and energy efficiency. He argues that design principles based on thermodynamics apply as much to organisms and social phenomena as they do machines. In constructal theory, dendritic patterns provide axiomatic examples of flow optimization; Adrian believes the laws of physics prevail equally in human and natural systems. Our paths having crossed because of an exhibition certainly exercised my understanding of the subject. RB: How much has the imaging of this form been inflected by visual culture? Helen Pynor is represented in Sydney by Dominik Mersch Gallery. She is represented in London by GV Art, London.